When NAD’s 3020 first appeared at the beginning of the eighties, it swept all other budget integrateds aside, along with countless amps selling for well over twice its price. For the next few years, the hi-fi market cried out for something with a similarly remarkable combination of price and performance, but at a higher level. Then in 1985 Mission finally gave the world what it was waiting for with the new Cyrus Two. 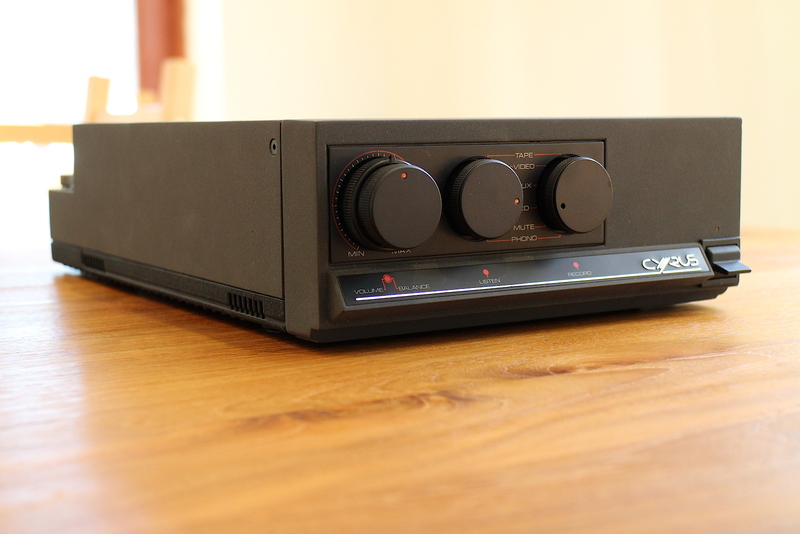 One of the Huntingdon company’s greatest ever successes, here was a small (210x 90x 340mm) amplifier packing a far more powerful punch than it had a right to, at a lower price than you’d expect. As such, it was both the natural next step from a NAD and a fantastic bridge to the high end. Selling for most of its life at £299, the Two cost twice as much as its smaller Cyrus One brother. Although visually identical – fascia legend aside – it was a heavily reworked version of its capable sibling. The 50W RMS per channel design boasted an extra 20W, along with double the output current driving capability. The disc stage was also extensively tweaked with superior sounding circuitry and no less than 11dB of extra signal to noise ratio. Like the Cyrus One, internal construction comprised a single printed circuit board and large toroidal mains transformer. Fast complementary power transistors were run in Class AB mode giving direct coupled output. In NAD 3020 style, the rear connections were all RCA phonos facing upwards on a horizontal ledge – great for access but a ticking timebomb of a dust trap! Two separate pairs of phono sockets were provided for MM and MC (a la Audiolab’s 8000a), plus a toggle to switch between the two. Inputs were comprehensive by eighties standards, with five available. The Two also brought an innovative new feature to the party – a socket for the £200 external PSX power supply which considerably improved the amplifier’s sonics. The big Cyrus is an extremely charismatic performer that’s both obviously flawed and spectacularly gifted. Essentially it takes any music you care to feed it and forcibly ejects it through your speakers like there’s no tomorrow. A fast and furious listen, it’s a tremendously engaging performer that grabs rhythms and dynamics by the short and curlies, and grips like nothing this side of a Naim NAP250. With smooth ancillaries it’s a fantastically enjoyable listen that seems to turbocharge everything it touches, making it sound bigger, brighter, bolder and larger than life. So great is its grip that even slow, unresponsive speakers are beaten into submission and start to boogie. Bass isn’t fantastically strong, but is delightfully supple. The downside is that it has a naturally bright, almost chrome plated sound that needs careful matching and tuning to assuage. With a smooth vinyl source, for instance, its superb phono stage lets the amp’s natural talents shine through with a fast, detailed and well balanced sound. With a cheap CD player however, it’s Paracetemols all round and an early bed. The trick is to use good mains cable and smooth silver speaker wires and interconnects. Match it to even handed loudspeakers (like Mission’s own 752s) and it really sings. Both Cyrus amps got regular minor component changes and upgrades, but can be broadly divided into three series. The first 1985 incarnation had a plastic case and featured a push-button power switch beneath a pilot LED. The second series which followed a couple of years later can be identified by a backlit Cyrus logo instead of an LED indicator, along with the use of a metal case. The third series arrived in 1990 and featured the new, non-backlit Cyrus logo (with no mention of Mission to be seen), flip up power switch and tiny round LED pilot lamp, plus a dual-ganged volume/ balance control and switchable muting. The later the model, the better the sound. Particular sonic advances were made in the final years of production, making the last of the line the most desirable. The final £399 Cyrus Two was replaced by the £499 Cyrus Three, a better packaged yet sonically inferior product. The biggest disappointment was the phono stage, which seemed miles behind the accomplished standards of its predecessor. These days you can pick up Cyrus Twos for anything from £100 to £400 depending on age and condition, making them great value for money. Thirty years since they were first introduced, they still whip many of today’s sub-£1,000 integrateds if it’s thrills you seek, which is an amazing achievement. I HAVE THE LATEST CYRUS 2 SINCE NEW.HAD THE CAPS REPLACED AND IT SOUNDS LIKE NEW! The circuit board had a spot for the 3 pin DIN socket.Just remove the cyrus 1 fuses, plug in the umbilical and voila: VIOLA!! The internal psu now only powers the preamp section. Amazing improvement in headroom. NO more clipping! This is spot on, I owned a Cyrus 2 and PSX and the sound would harden up considerably once the volume knob gets beyond 12 O clock add dry and bright to your observations on the chrome plated but maybe we hear the same thing. Regardless I think it needs careful matching with ancillaries and cable as well as driving speakers that have an easy load, when it starts to run out of breath its unlistenable. I still use mine with Musical Fidelity MC2s. At the other end, a 1983 LP12. They remain my prize possessions. I’d like the speakers rebuilt with nicer looking boxes though.